AVALON SUN TO SUN RENTAL! BEAUTIFUL 4BR, 3-1/2BA W/POOL AND CABANA! JUST STEPS TO THE NORTH END OF DOWNTOWN AND 3-1/2 BLOCKS TO THE BEACH! NEW TO THE AVALON RENTAL MARKET - SUNDAY TO SUNDAY RENTAL!!! Check out this beautiful newer construction 4 bedroom 3.5 bath home. (1st floor den with pullout can double as a 5th bedroom!) The welcoming front wraparound covered porch is the perfect place to sit back and relax. This home has a traditional layout with the main living area on the 1st floor. The open and spacious kitchen features white cabinets, stainless appliances, granite counter tops & counter seating. There are 2 living areas on this floor - the great room opens up from the kitchen and there is a separate den with queen pullout which could be utilized as a 5th bedroom. There is a powder room and a full sized laundry room with front loading washer/dryer to complete this level. Take the stairs to the second floor which features 4 bedrooms. The king master suite has a private deck area overlooking the pool and large master bath with double vanities and large tiled glass shower. There is another King suite with private bath, a queen bedroom and a bunk room with Full/Full bunk and a twin/twin bunk. The full hall bath has a large tiled glass shower. The outdoor area features a large, heated in~ground pool, spacious covered deck area, cabana with bar seating, TV, fridge, ice maker and sink. The perfect place to have the attitude of "IT'S FIVE O'CLOCK SOMEWHERE!" The pool area is very private and is surrounded by mature landscaping. There is a garage area for storage of your bikes and beach gear, and a large driveway that can accommodate 4+ vehicles. Beautifully furnished and appointed this very special home is the place to create your Avalon beach memories! Owner provides beach tags, beach chairs, umbrella & cart. Please note - the map on this listing is incorrect. 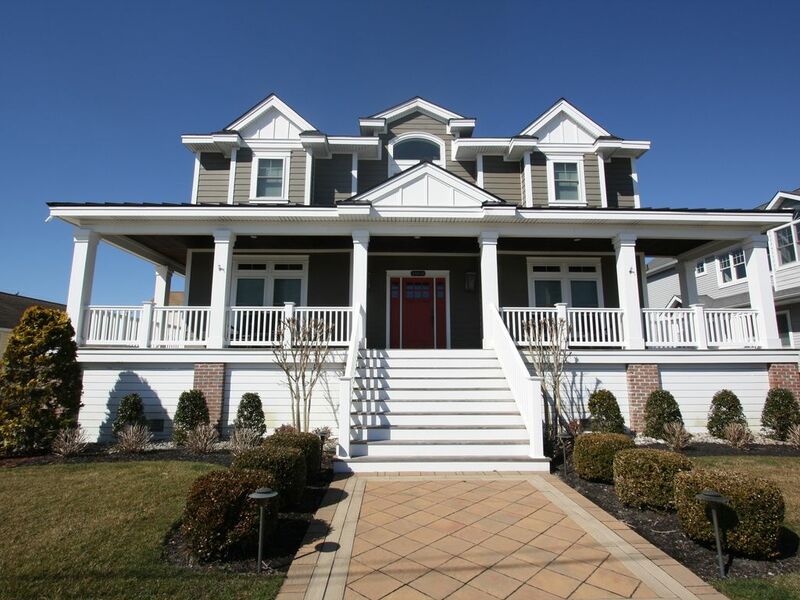 This property is located at 1868 Dune Drive, Avalon. Just steps to the north end of town! Just 3-1/2 blocks to the beach! Walk to restaurants, shopping, ice cream, mini golf & more! Additional seating on the adjacent 1st floor deck overlooking the pool!